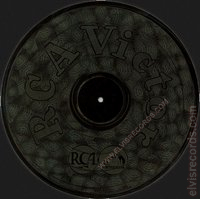 Disc: Maroon label.1 The other side is etched RCA Victor with RCA logo with intricate weblike patterns throughout. 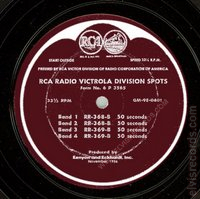 One sided radio spot promo with four tracks or bands. 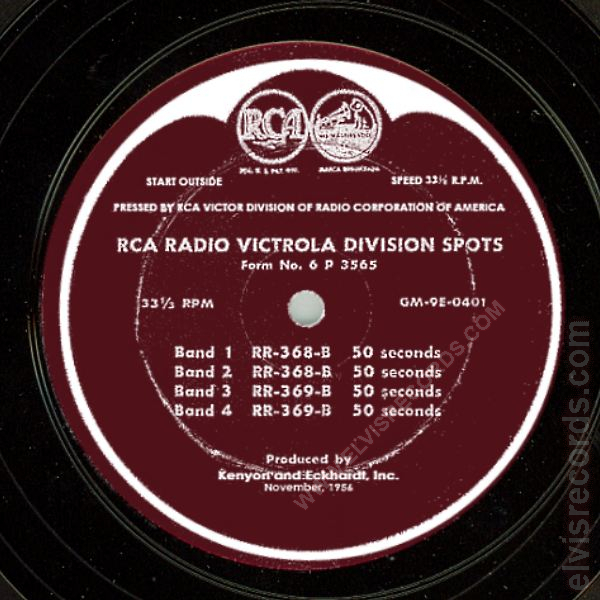 Reads PRESSED BY RCA VICTOR DIVSION OF RADIO CORPORATION OF AMERICA, RCA RADIO VICTROLA DIVISION SPOTS, Form No. 6 P 3565. In two locations shows the speed of 33 1/3 RPM. Catalog number to the right with GM-9E-0401. 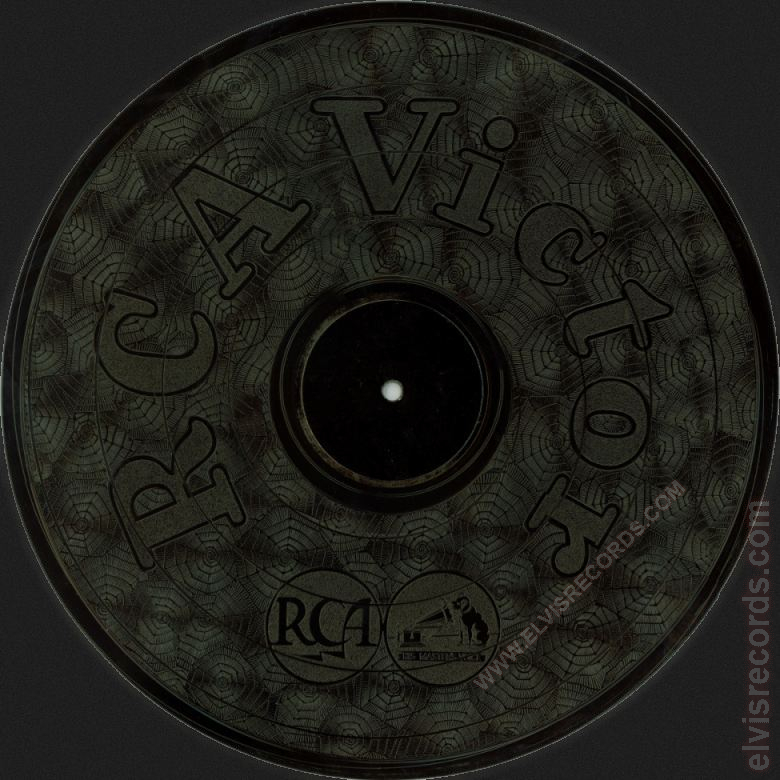 Two tracks feature Elvis Presley promoting the RCA Victor Elvis Presley Record Players. There are two models. One for $32.95 will get the SPD-22 EP, the other is an automatic for $44.95 will get the SPD-23 EP. Various Internet sources, including Elvis Presley TCB have this audio available. After a few plays, here are the transcripts. Hello friends, this is Elvis Presley and that was only one of twelve of my records that RCA Victor has put out in two great 45 extended play albums. There's also "Blue Suede Shoes", "Hound Dog", and lots of others. And you people can have 'em absolutely free. All you gotta do is buy one of RCA Victor's great new record players, made especailly for you. They call 'em Elvis Presley Autograph Models, with my name stamped on top. One of 'em plays all four speeds. It's a portable. It's only $32.95, including eight of my records. Then there's another portable, an automatic, just push a button an [music cues up with ... Don't Be Cruel to a heart that's true] This one's only $44.95, and with this you get all twelve songs free. But hurry while this great offer lasts, friends. Just buy one of RCA Victor's Elvis Presley Record Players. See you in the movies, when "Love Me Tender" comes to town. Thank you very much. But did you know that's only one of twlve of my records that RCA Victor has put out in two great 45 extended play albums. Ther's also "Blue Suede Shoes", "Hound Dog" and lots of others. And I'd like to tell you how you can get either one of these albums absolutely free. All you gotta do is get one of RCA Victor's new record players - a Elvis Presley Autograph Model. They aren't hard to take, either. They're finished in blue denim with my name stamped on top. One of 'em plays all four speeds. It's a portable. It's only $32.95, and you get eight of my records absolutely free. Then there's another portable, an automatic, just push a button an [a piece of "Tutti Frutti" plays]. this one's only $44.95 with all twelve songs free. But hurry while this great offer lasts, friends. Just get one of RCA Victor's Elvis Presley Record Players and you get all the records free. See you in the movies, when "Love Me Tender" comes to town.